In running, they say, “vary the terrain.” Roads, trails, hills, flats. Different types of terrain develop your fitness in different ways. I recently found this tidbit applicable to… yoga teaching. In winter I taught a small class at a community centre. Whether due to demographics or to coincidence, all of my students were older (55 to 65) and dealing to physical limitations. One woman had both rheumatoid and osteo arthritis. Another had extreme bunions and was recovering from foot surgery. One man had very limited range of motion across his joints, especially his shoulders. The class was intended for “all levels” class but by default I had to teach a gentle/restorative/55+ class. Once, after Adho Mukha Virasana (Child’s pose), I instructed the class to push up into Adho Mukha Svanasana (Dog pose), a basic transition. The student with the foot problem was stumped. “How do you get there from here?” she asked, stuck on all fours. I talked her into Dog pose that day—and again in subsequent classes. It was a learning experience not only for her but for me, too, to guide someone through a transition that seems so obvious. My classes typically lean toward strenuous and strict, rather than gentle and easy; this approach suits most of my students, who are relatively fit and want me to correct, adjust, and guide them to their personal best. Here, I had to adapt with a softer approach. 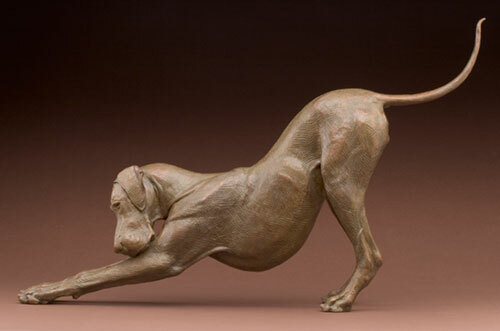 At those venues, the Dog pose dilemma that I encountered would never arise. First, students are either athletic or experienced enough to figure out how to “get there.” Second, classes are too large to invite questions and other such “interruptions” by students. Teaching large classes at large studios might be a good way to learn poise. It takes confidence to engage a group of 30 or 60 or more students. But it takes another type of know-how to work with novice students individually, especially students with limited physical ability. Here, a teacher has great responsibility for students’ safety. It also takes real creativity to teach “just the basics” through modified poses, transitions, and sequences. Even the vibe is different: one cannot rely on “tricky” poses or communal rajasic energy to drive the class. The energy must derive largely from the teacher. While it makes sense for advanced practitioners to teach advanced classes, a teacher is no less advanced if she teaches beginner classes. I myself found it harder to teach that gentle class than my more-vigorous classes. It might behoove us teachers to teach a variety of students in a variety of settings. Like varying the running terrain, we might learn much from varying where and whom we teach. I completely agree with your perspective. I have been teaching yoga for 2 years now and it is my nature to teach a more vigorous and adventurous class. I find myself struggling to know what is actually gentle enough for students. I do not judge but growing up a dancer, I can’t relate to not knowing how to use my body. I find I learn a lot more after a gentle or beginner class. Thank you for reminding us to appreciate all students and what they have to offer us. Excellent post, YogaSpy! (Yes, I’m finally re-emerging from my long period of being too buried under work to read blogs.) In fact, I would say that it takes much MORE skill and knowledge to work with beginners and even more, to work with limited and special-needs people. I tell my teaching apprentices that once you can tell a class “set up for supta baddha konasana” and most of the students know what to do, your job is pretty easy. There is a certain skill set required for leading a large class through a vinyasa sequence, it’s true, but the requirements are very specific and limited, and a teacher’s popularity in that setting is often about the appeal of their personality (charisma, confidence) and how advanced their own practice is rather than anything they actually have to offer the students. As I’ve said here before, leading is not teaching. And teaching should be about the students, not the teacher. Yes, great advice! We all should “vary our terrain” as teachers and also as students too. Next Next post: Have you tried the Three Minute Egg?